While renovating a town building in Hyannis, workers fear they were not only exposed to asbestos, but town officials in Barnstable knew it and didn’t tell them. Cases like this reveal why our Boston mesothelioma attorneys know that diagnoses of this deadly cancer aren’t going to disappear completely this century. The disease stems solely from airborne contact with this toxic organic fiber, and it’s everywhere – in homes, school and government buildings, motor vehicle parts, construction materials and insulation – the list goes on. It’s bad enough that the workers who originally installed it likely became ill due to their exposure, about which their employers knew the risks but failed to warn. But now, we are seeing a whole new generation of workers being placed at severe risk for illness when these older structures require renovation or demolition. The dangers are more widely known today by the general public than they were 40 years ago. However, workers rely on their employers to conduct due diligence in not only determining whether asbestos is present in a structure but in then following state and federal law to minimize the danger in its handling and disposal. Responsibilities also include informing workers when asbestos is present and providing respiratory protection when necessary. A union leader for the workers says that whether the actions of the town’s management were intentional is not yet clear. But if the town didn’t know asbestos was present in the construction site, they had a responsibility to know. At the very least, the union leader pointed out, a failure to warn and protect workers would rise to the level of gross negligence. The renovations were being conducted to a building to that houses a number of the town’s government offices, including school administration. The material was discovered by a number of workers, shortly after the renovations got underway. The workers took the material to their supervisors, and demanded to know whether the material was in fact what they suspected it was. They wanted it tested. However, the supervisors assured them that no asbestos was present in the area where they were working, as the town had already conducted appropriate testing. The workers kept pushing to have the material tested. It eventually was tested, and the results were sent to the town within 24 hours. The test was positive. Yet that finding wasn’t shared with the workers until almost a month later, and even then only after the workers filed a labor grievance. The testing revealed that the materials contained chrysotile asbestos, known definitively to cause mesothelioma, even with minimal contact. 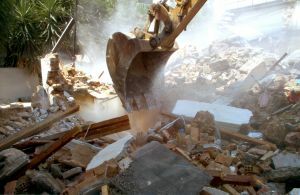 The workers have grave and legitimate concerns because at one point during the project, an industrial-strength vacuum cleaner was used to blow some of the asbestos material into the air as part of the clean-up. None of the workers in the area wore masks or respirators. Some were covered with dust. They wiped their hands on their faces and, in some instances, they were eating immediately afterward. Still, town officials insist that the asbestos material was limited to part of the floor that hadn’t yet been removed. We question this, however, because the workers reportedly came in contact with enough of it to provide a sample for testing. Workers are now demanding that the state’s attorney general launch an investigation into the matter. Although mesothelioma isn’t likely to reveal itself for years if not decades, early detection is critical, so we would encourage anyone who might have been exposed to visit with their doctor and be vigilant regarding any symptoms as time wears on. We would also encourage at least meeting with an asbestos injury lawyer to learn about your possible options for compensation.